theZoomer: Television For Boomers With Zip! ABOUT theZoomer - theZoomer: Television For Boomers With Zip! theZoomer is an exciting, timely and gutsy new 60-minute current affairs show airing Monday evenings on VisionTV. 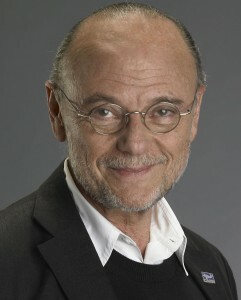 Created by ZoomerMedia Founder and VisionTV Executive Producer Moses Znaimer for and about Canadians 45-plus years of age, theZoomer offers groundbreaking, intelligent, and hard-hitting discussion on how our growing demographic is changing Canada and the world culturally, socially, politically, economically. It’s the next step in his New Vision of Aging, that is, Moses’ crusade to alter the stereotype and shape the agenda when it comes to topics of greatest importance to Canadians as they age. In every episode, with wit, verve, tongue, and cheek, Conrad will conduct a feature Conversation With Conrad, or participate in a panel discussion with some of the world’s Greats. His weekly Talk Black editorials will tackle issues that really get under his skin – the US justice system, prison reform, religious persecution, ageism, and the world’s financial crisis to name a few. Conrad Black will moderate the The Zoomer Round Table, a lively discussion of current affairs, health, finance, and new ideas accompanied by cooking, humour, and live performances.